Electraeon Dark Series Derby Covers for Harley Davidson Motorcycles. 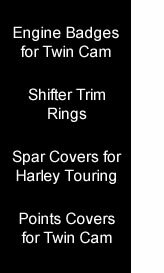 Dark Series Derby Covers for Harley Davidson Motorcycles. Dark Series Derby Covers are CNC machined from 6061-T6 billet aluminum and finished in Black Wrinkle powder coat to match Night Train, Street Bob, and Fat Bob motorcycles. The low key styling of this series is not noticeable at a distance, but close to the bike the details become apparent. This series is great for customizers seeking for an understated look with nothing reflective to disrupt the flow of the bike. Fits all 1999 to 2018 Twin Cam equipped models with the use of HD derby cover gasket # 25416-99C (replaces the O-ring style on the Twin Cam 96 motors). Easy to Install, takes about 5 minutes. Matching Points Covers are also available. Online order cart is at the bottom of this page. Dark Series Street Bob Derby Cover. Dark Series Night Train Derby Cover. Dark Series Ball Mill Grooved Derby Cover. Dark Series Radial Stepped Derby Cover. Dark Series Arc Stepped Derby Cover. Dark Ace Derby Cover. and store policies please visit the Policy page.